THOUSANDS of angry residents defied a curfew in the Indian portion of Kashmir on Tuesday, protesting the overnight killing of an 11-year-old boy by government forces, reports Aijaz Hussain of The Canadian Press. Fifteen people were wounded in the southern town of Anantnag late Monday when government forces shot into a crowd despite an appeal last week from Prime Minister Manmohan Singh that they use non-lethal measures to control the demonstrations that have become a near daily occurrence in the volatile region. At least 65 people have died in anti-India demonstrations and clashes between security forces and protesters in Kashmir since June. Each death has triggered more protests despite a rigid curfew in the Kashmir valley. Anger against Indian rule runs deep in the region, which is divided between Hindu-majority India and predominantly Muslim Pakistan and claimed by both nuclear-armed nations in its entirety. 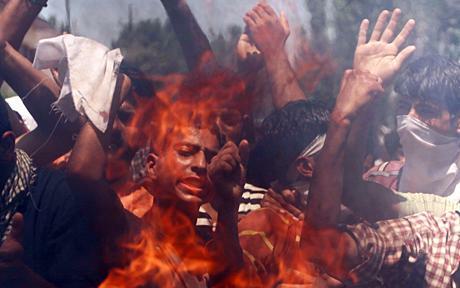 The latest deadly unrest against Indian rule shows no signs of abating despite the deployment of thousands of troops. Thousands of residents marched in Anantnag early Tuesday within hours of the death of the young boy. Police and paramilitary soldiers fired warning shots and tear gas to quell the protests, wounding three people, said a police officer on condition of anonymity as he was not authorized to speak to media. In Srinagar, the region's main city, hundreds of men, women and children also held angry protests. They chanted "Go India, go back" and "We want freedom." Police and paramilitary soldiers withdrew from the area to avoid clashes but sealed off the streets with razor wire and steel barricades. POLICE in Northern Ireland have been blamed for provoking a riot in a seaside town. Reports The Belfast Telegraph: "The riot squad was called in after officers were attacked with bottles and other missiles by crowds in the centre of Ballycastle, just hours before the start of the famous Auld Lammas Fair. Two officers were injured. "The street disturbances, which began after the pubs closed, lasted an hour. "Tens of thousands of people later packed the town for the event which claims to be Ireland's oldest festival. But the police tactics used to quell the trouble in the early hours were heavily criticised. "Padraig McShane, an independent member of Moyle District Council, who watched the police in action claimed the officers over-reacted and goaded some of the young people. He said the atmosphere in the town had been good until the riot squad arrived. 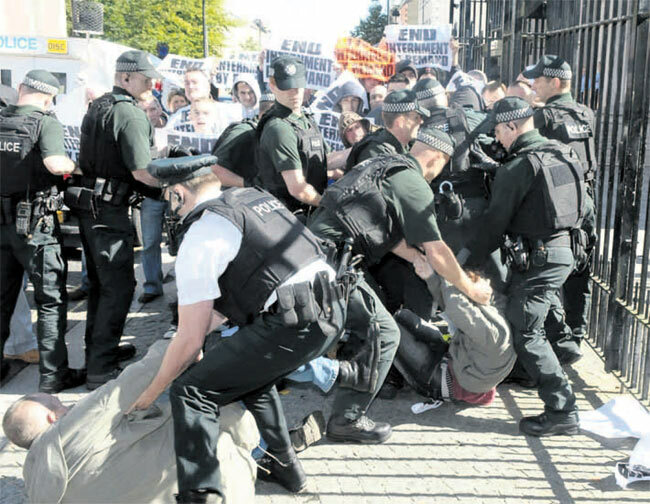 "Mr McShane said: 'This was heavy handed policing. They were very aggressive and the batons were out before the arrests. It's very easy for the police to look at young people on the wrong side and give them a hard time. But that's what happened and the violence was not a reflection of the people of Ballycastle'." NAXALITE rebels have staged a successful ambush of Indian state forces near Rapur. Reports AFP: "Maoist guerrillas killed five policemen in a gunfight in India's central state of Chhattisgarh on Sunday, a senior police officer told AFP. "Three of the men belonged to the elite Border Security Force paramilitary group and two were regular police officers, Chhattisgarh's anti-Maoist operations chief Ramniwas, who only uses one name, told AFP. "The clash took place in Kanker district, 175 kilometres (110 miles) south of the state capital Raipur. "Kanker is the headquarters of a police jungle warfare school which trains security personnel in the government's increasing efforts to tackle the Maoist insurgency. 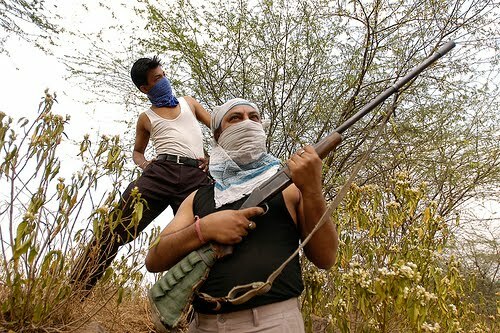 "Chattisgarh is a stronghold of the rebels, who killed 15 police officers in an attack in the state two months ago. "Authorities in New Delhi launched an offensive last year to tackle the worsening insurgency, but since then the Maoists have hit back with a series of bloody strikes. "Maoist rebel groups have fought for decades in east India against state and central government rule, drawing support from tribal groups and landless farmers left behind by the country's economic expansion." 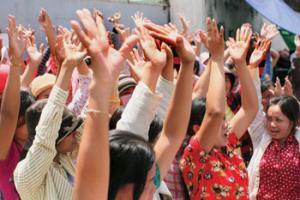 WORKERS in Cambodia have rebelled against capitalist employers and union bureaucrats by staging wildcat strike action, reports Infoshop News. In the past few days, a garment workers' strike has found itself in conflict with bosses, local authorities and union officials while last week, construction workers struck in solidarity with sacked workmates. Around 160 garment workers continued to strike on Monday (22nd August) outside the gates of a factory in Meanchey district, where they have camped out day and night since Thursday to agitate for improved working conditions. Ien Pov, a union representative at the Sun Lu Fong factory, said workers had made eight demands to the factory’s management, including a request that workers receive US$80 in severance pay for every year they have worked at the factory. “Most workers want me to continue to hold the strike after learning that the factory owner has violated their rights and the law,” he said. Som Aun issued a letter on Saturday calling the strike “illegal” and said that the confederation had decided in a meeting on August 16th not to sanction the strike because he wanted to meet with the factory’s management to discuss the workers’ demands. Last week, the Arbitration Council dismissed a complaint filed in July by 160 workers from the factory, citing the illegality of the resignation clause. “The factory will discuss their demands and try to solve the problem outside the court system if the approximately 20 percent of workers who are on strike agree to go back to work,” Som Aun said. Meanwhile, Keo Sareoun, the chief of Chak Angre Leu commune, said authorities planned to crack down on the striking workers today: “It is difficult for us to maintain order and safety at night when such an anarchic strike is happening,” he said. “On Monday, I will not allow them to protest in the area any longer.” He declined to say what measures would be taken to disperse the protesters. Ien Pov said that about 20 local police officers had already warned the protesters. “The police have told us that if we continue to protest our security cannot be guaranteed,” he said. SOUTH African workers are rising up against the corrupt ANC regime. Reports The Guardian: "South Africa's president, Jacob Zuma, is facing one of the biggest tests of his presidency as tens of thousands of striking workers took to the streets and relations with his union backers neared breaking point. "There were demands for Zuma, who was thousands of miles away at the World Expo in Shanghai during a state visit to China, to return home as cities were paralysed by marching public sector workers. "The Congress of South African Trade Unions (Cosatu) warned that its historic alliance with Zuma's governing African National Congress (ANC) had reached a critical low. "Zwelinzima Vavi, secretary general of Cosatu, said government corruption had derailed the alliance's agenda. 'The emergence of a 'new tendency' focused on taking over the ANC and using access to the state for a selfish accumulation agenda disrupted the emerging unity of purpose, which has led to a paralysis in both the alliance and government,' he said. 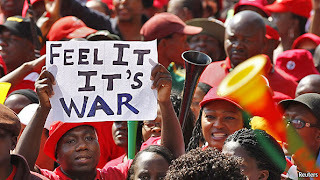 "Cosatu, which says it has 2m members, has warned of a "total shutdown" of the South African economy next week if the government does not meet its demand for an 8.6% wage rise and 1,000 rand (£88) monthly housing allowance. "Cosatu said it had filed seven-day strike notices for members to join the state workers in a stoppage that would then hit mining and manufacturing. Police and army medics could also join in, bringing the country to a standstill." IRAQI resistance fighters have set out their stall in no uncertain fashion with a wave of coordinated strikes across the country, reports The New York Times. In attacks in 13 towns and cities, from southernmost Basra to restive Mosul in the north, insurgents deployed their full arsenal: hit-and-run shootings, roadside mines and more than a dozen car bombs. The toll was in the dozens, but the symbolism underscored a theme of America’s experience here: its deadlines, including the Aug. 31 date to end combat operations, have rarely reflected the tumultuous reality on the ground and have often been accompanied by a wave of insurgent attacks. In coming days, the Obama administration will seek to portray the reduction in troops here to fewer than 50,000, reached Tuesday, as a turning point in seven years of invasion, occupation and war. President Obama will deliver a speech on Tuesday marking the deadline. The next day, the mission will be renamed “New Dawn” at a ceremony expected to draw much of the military brass to a sprawling base near the Baghdad airport. Throughout the partial withdrawal, American officials have insisted that, while work remains, Iraq’s army and police force are ready to inherit sole control over security here. 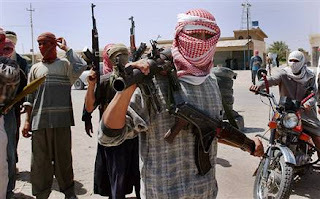 Military officials have said they believe that insurgents number only in the hundreds, and the military has issued a daily drumbeat of announcements that leaders and cadres in the insurgency have been arrested or killed in American-Iraqi operations. Wednesday’s attacks, which killed at least 51 people, many of them police officers, were seemingly the insurgents’ reply. A LONDON riot squad officer has been charged with assault after a boy aged 16 was pushed backwards through a shop window, reports the Evening Standard. Pc Marcus Ballard, 29, a member of the Territorial Support Group (other members of whom are pictured in action above), will appear before magistrates next month to face two counts of common assault. Pc Ballard was part of a TSG unit that was called to support local officers dealing with a disturbance on a bus involving a large group of youths in Bromley in February. The unit remained in a parked van while several suspects were questioned. But after two young women approached the van, two officers got out to speak to them. One of the officers then “came into contact” with the boy and he crashed through the window of Magnet Kitchens in Bromley High Street. He was not seriously injured but was arrested, interviewed and released on bail before being told no further action would be taken. The Independent Police Complaints Commission investigated after colleagues of Pc Ballard reported concerns to anti-corruption officers. In a separate case, four TSG officers are to face assault charges over a raid on Muslim terror suspect Babar Ahmad, 36, in Tooting in 2003. A member of the TSG was also investigated over the death of Ian Tomlinson during the G20 protests last year. Pc Simon Harwood is facing the sack at a misconduct tribunal over allegations of using excessive force. The CPS decided not to prosecute. A RUSSIAN rock star is backing a campaign against a new motorway through ancient Khimki Forest. A few weeks ago anarchists stormed a town hall in protest, pelting it with smoke grenades and fireworks and painted slogans on the walls. Now the campaign has become a national cause celebre. Reports The Independent: "Hundreds of Russian police surrounded a central Moscow square yesterday as a prominent critic of Prime Minister Vladimir Putin led a protest concert against a road-building scheme that is becoming a focal point for demonstrations against the Kremlin. "More than 1,000 people gathered at Pushkin Square to protest against a new road that will go through Khimki Forest just outside the capital, part of a new highway between Moscow and St Petersburg. "Organisers of yesterday's meeting had planned a protest concert by Yuri Shevchuk, one of Russia's best-known rock musicians, who confronted Mr Putin about democratic freedoms this year during a televised meeting. "But police surrounded the square and refused to allow any equipment in, forcing the singer to sing without a microphone through a barely functioning loudspeaker, from a makeshift stage. "Activists say that there are several alternative routes for the highway that would avoid the forest. The long-running protest has led to several activists being detained, facing court cases and fines. "Ms Chirikova has been detained by police on several occasions, and after emerging from a courtroom three weeks ago was bundled into an unmarked car by police and driven away. She was later released. 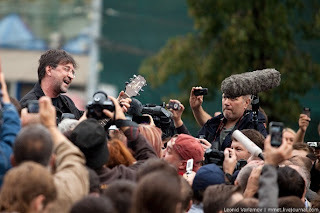 "Yesterday, Shevchuk sang songs including one called 'When the oil runs out', which talks about a bright future for Russia when the country stops relying on exports of natural resources. In May, he confronted Mr Putin during a televised meeting between the prime minister and cultural figures in St Petersburg. Shevchuk complained that Russia was ruled by 'dukes and princes with sirens on their cars', and asked Mr Putin if he really wanted a society with real democracy where 'people stop being afraid of policemen on the street'. In one of the most frank discussions that Mr Putin has faced in his decade in power, Mr Shevchuk also asked why police break up opposition rallies brutally. A visibly irritated Mr Putin said that 'without a normal democratic development this country will have no future', and said protests should be allowed, within reason. But this did not stop police from dispersing, with their usual vigour, a large protest rally in Moscow a few days later." PROTESTERS are aiming to shut down a bank's HQ on Monday as the culmination of days of action. They have set up a camp right next to the offices in Scotland and there have already been clashes with police. The BBC reports that two women have been arrested after the climate change protesters attacked the Royal Bank of Scotland's Edinburgh headquarters on Sunday. It says: "More than 100 protesters took part in the action, which also involved an oil-like substance being thrown at the building and windows being smashed. "Campaigners bearing a banner reading 'Greedy pigs, bankrolling the climate crisis' tried to enter the bank's headquarters." The Camp for Climate Action website explains it is a "grassroots movement taking direct action against the root causes of climate change". It adds: "After mobilising and helping stop the proposed third runway at Heathrow and a new coal fired power station at Kingsnorth, we're growing into a mass movement reclaiming our future from government and profit-hungry corporations. "This year we're targeting the Royal Bank of Scotland. "Last year RBS were bailed out with £50 billion of public money. This bank is one of the world's largest investor in oil, gas and coal. From tar sands extraction in Canada to coal infrastructure here in the UK, we're paying to trash our future. "These projects are not just causing catastrophic climate change, but destroying the lives and livelihoods of people across the globe. Meanwhile, we're told there is no money left and we should be braced for decades of public sectors cuts. "Ecological destruction is built into the mechanics of the financial system, with communities disenfranchised from their own futures. This is why people from across the UK will be converging to take back the power and Break the Bank!" People resisting climate change closed down the Royal Bank of Scotland's Global HQ at Gogarburn near Edinburgh and took direct action at numerous sites throughout Edinburgh today 23rd August. The Camp for Climate Action said: "We are celebrating a successful day targeting various climate criminals - holding direct actions, demonstrations and street theatre confronting the role of financial institutions like RBS in bankrolling climate change." 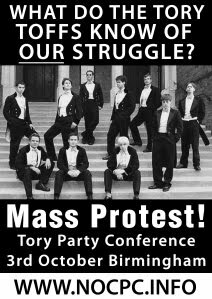 THE CALL has gone out for militant protests against the Conservative Party Conference in Birmingham, UK, on October 3. Here is the posting from Toffs Out! If the corporate involvement of the CPC hasn’t pissed you off enough, the Tories will be holding various champagne breakfasts, dinners and events in Birmingham to discuss cuts in spending that will negatively impact on our lives over the coming months whilst the rich and corporations continue reaping the benefits. They talk, but what the hell do these bastards know of our struggle? Enough! You have bitten the hand that fed you for the last time. CPC Convergence Direct Action Bloc! Spread the word and get organised. ANGRY protesters have blocked the entrance to a court in Derry where an Irish republican faced a bizarre terrorism charge. 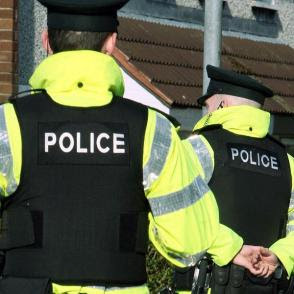 Gary Donnelly, 39, is accused of ' having a mobile phone that was used for purposes connected with the commission, preparation or instigation of an act of terrorism', reports the Belfast Telegraph. The police (RUC) allege a phone call to a journalist claiming responsibility for two pipe bomb attacks by the Real IRA had been traced to Mr Donnelly's phone. His supporters point out that this sort of call would hardly be made on someone's own phone and add that the journalist specifically said it was not Mr Donnelly's voice. They say the whole case is nothing but a set-up by the British state and blatant political intimidation of the 32 County Sovereignty Movement, of which Mr Donnelly is part, and radical republicanism in Northern Ireland as a whole. The protesters held placards referring to the "Internment by Demand" and chanted "SS RUC" at police outside. The district judge rejected the police's call for bail to be refuse and released Mr Donnelly to appear again on September 20. 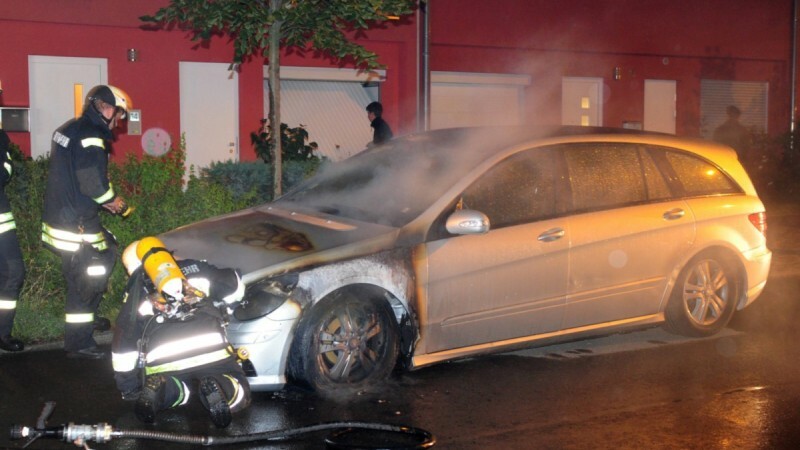 HUNDREDS of luxury cars are still being torched every year in Germany as part of a radical uprising against the capitalist system. There is a website calling 'burning cars' (Brennende Autos) which plots arson attacks on a Google-powered map. The featured area is centred around Berlin, but there are so many incident flags on the map that the city is obscured, apparently overwhelmed by the rampaing fires. 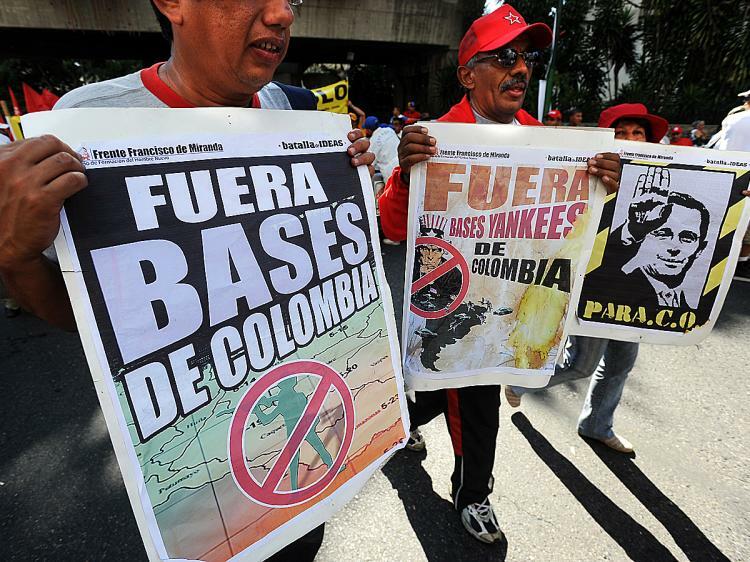 A DEAL that would US troops above the law in Colombia has been blocked by the South American country's courts. Reports antiwar.com: "Colombia’s Constitutional Court has announced that it is suspending a deal to provide US troops with increased access to the nation’s military bases as part of 'anti-drug' operations, insisting that such a deal could not be done unilaterally by the president. "Instead, President Juan Manuel Santos must seek congressional approval for the deal, and even then the court will almost certainly be challenged on the constitutionality of the deal. The court declined to even consider that aspect yet, insisting that it couldn’t do so until the deal was legally made in the first place. "The deal was reached last year by then-President Uribe, and gave the US not only increased access, but gave US troops blanket immunity from criminal prosecution in Colombia. The deal was harshly criticized by Colombia’s neighbors as giving the US an unacceptable foothold in South America. "Particularly irked was Venezuela, which has been increasingly at odds with Colombia over Marxist rebels along their mutual border. The deal means that any war between the two nations would inevitably draw the US in. " RADICAL anti-militarists in Brighton, UK, are calling for outside support to help close down a weapons factory. The Smash EDO! campaign is staging a mass demo on Wednesday October 13 and is urging a big mobilisation for the action. 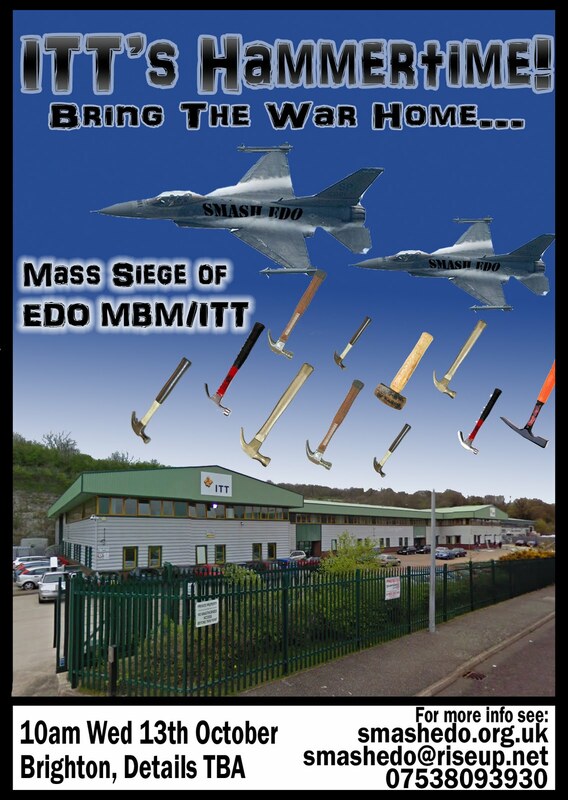 Says a post on Indymedia UK: "EDO make weapons components vital for the waging of aerial war. 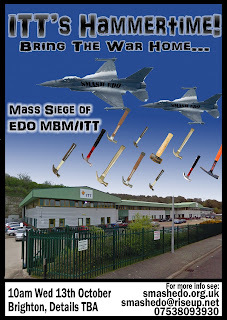 EDO's technology is used to attack people from Palestine to Iraq, from Afghanistan to Pakistan. They arm F-16s, build components for Paveway bombs and help develop technology for Predator and Reaper drones. "During Israel's 2009 massacre in Gaza the 'decommissioners' broke into EDO and by causing hundreds of thousands of pounds worth of damage shut down the production line. Their defence was that theyu were acting to prevent war crimes. Sixteen months later they were found not guilty by a unanimous jury verdict. "The question after all this is, how long can EDO sustain their bloody business in Brighton? Now it's time for a final push to remove the factory from Brighton. "Our action comes at a time when the people of Afghanistan are being targeted by remote control. Unmanned drones pilotted by mercenaries on the other side of the globe are used to maintain aerial supremacy in Afghan skies. Hundreds of thousands of Afghans have died in the nine year assault. Now is the time to attack the industries which are propping up the occupation. "Can you publicise ITT's Hammertime in your local area - If so contact smashedo@riseup.net and we'll send you some flyers and posters." The Hammertime Flyer is available online. A video documentary on the campaign can be seen here. 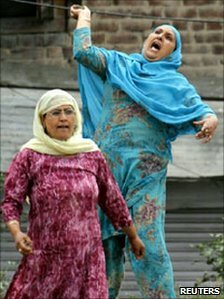 WOMEN are playing an incrasing frontline role in the Kashmiri people's struggle for freedom. Reports Soutik Biswas for the BBC: "Young and old, middle-class and poor, mostly dressed in floral tunics, they defy the armed forces, pelting stones at them, shouting slogans and singing anti-India songs. When night falls, some of them even lead protests with their children." Firdousi Farooq became involved after her 14-year-old son was murdered by Indian state forces who claimed the studious youngster was a "miscreant who was part of an unlawful assembly". She said: "Why should I not protest? Why should I not pick up a stone? I am doing this in the honour of my martyred son. I am doing this for azadi (freedom) from subjugation and repression." Adds Zaitun Khan, a young woman whose brother was murdered by state forces whole on his way to work: "I will go and join the protests now. He never protested or threw a stone in his life. But he died. How many more men will have to die? I want to go out and protest and demand freedom. Freedom to live." The report explains this is not the first time that women in Kashmir have come out in droves to protest, but their numbers and impact appear to be greater than ever before. "This time the intensity of protests by women is more. You can also see more women protesting. Women have borne the brunt of the Kashmir conflict, and it is not surprising that they are at the end of their tether," says Kashmiri journalist Afsana Rashid. As Bashir Ahmed Dabla, who teaches sociology at Kashmir University says, Kashmir's women have "seen their children husbands and fathers being killed in the conflict, and routinely humiliated by the security forces". "Women have been compelled to come out and protest because of the injustice and repression," says Professor Dabla. SOME 5,000 foreign workers at an electronics factory in the Tebrau Industrial area in Malaysia staged an angry protest on Sunday following the death of a colleague. Reports asiaone news: "During the seven-hour stand-off, which started at 7am near the workers' quarters, the workers from Nepal, India, Myanmar and Bangladesh turned violent and threw chairs and rubbish in protest. "They claimed the worker died because of their employer's delay in sending him to the hospital." IRAQI resistance fighters have assassinated five collaborators with the US occupation. AFP reports that two policemen were shot dead and their bodies set ablaze at a Baghdad checkpoint on Saturday while two of their colleagues and a pro-American fighter were also killed. The insurgents shot the two policemen as they sat in their car in eastern Baghdad, an official said, and then set it on fire, while two others were killed by silenced pistols at a checkpoint in the west of the Iraqi capital. Saturday's incident was the third time in two weeks that members of the security forces' bodies have been burned after being killed by insurgents. 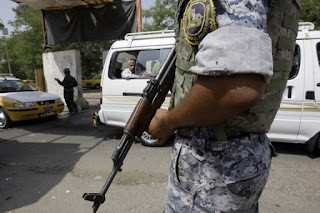 In Al-Shaab district northeast of Baghdad meanwhile, a member of the government-backed Sahwa (Awakening) militia was shot dead at a checkpoint, the official said, and two other fighters wounded. 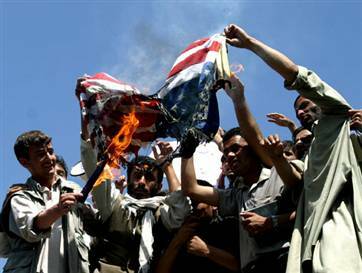 The Sahwa, known in the US military as the 'Sons of Iraq' sided with the US against the resistance from late 2006. A 'GREAT transformation' could sweep across the world as a result of radical action against the neoliberal G20 in South Korea this November. That's the hope of the anti-capitalists who are planning masssive protests against the neoliberal summit as the global financial elite clamps imposes its will on communities across the world. Writes Barb Dwyer on IndyBay: "While thousands of demonstrators have taken to the streets during past G-20 Summits in North America and Europe, South Korean workers and activists have a long history of being even more militant in their struggle against the destructive policies of globalization than their counterparts in the Northwest hemisphere. "In December of 1996, the South Korean parliament passed a new labor law which began a 'structural adjustment' austerity program on behalf of the IMF and World Bank. "These programs require countries to make debt repayment a priority, and as a consequence forces them to cut essential social services such as health, education, and development, thus lowering their standard of living. These programs also open the door to the privatization of natural resources, such as ancient forests and public water supplies, to be exploited by multinational corporations. "In the days that followed, 12 million South Korean workers went on strike to counter the new undemocratic labor law. In the years that followed, South Koreans continued to protest against the destructive policies of neoliberalism, most notably the WTO in 2003, World Economic Forum in 2004, APEC in 2005, and numerous other occasions. "South Korean workers have often utilized the direct action tactics of resistance, such as strikes and factory takeovers, to large street demonstrations. It is not uncommon that the workers are also armed with slingshots, molotov cocktails, and sticks. "Often times, in an act of more desperate resistance, workers commit suicide outside of their factories, sometimes through self-immolation. South Korean police on the other hand, much like their counterparts around the globe, have also demonstrated their willingness to continually brutalize their own citizens to quell public dissent of these policies. 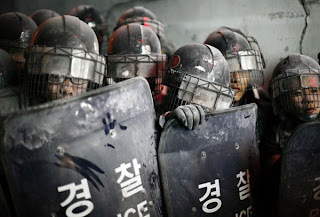 "It is a well documented and common tactic for South Korean police to scrape the bottom of their metal shields on the concrete in order to sharpen the edges into a blade before they thrust their shields into the throats of protesters. Over the years, this brutal police tactic has led to the horrific deaths of many South Korean workers. "All this comes at a time when the fallout from past G-20's are still fresh in the air. 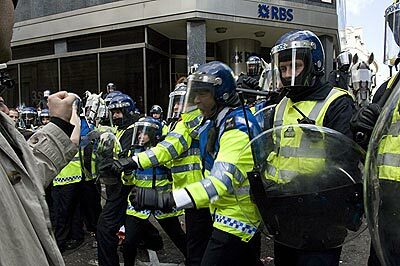 During the 2009 G-20 Summit in London, Ian Tomlinson was beaten to death by police. On July 21st, 2010, his wife and nine children learned that the London police would not investigate his death, despite video and photographic evidence. "None of the officers went to the aid of Tomlinson, who stumbled 100 yards down the road before collapsing and dying in front of thousands of demonstrators. In Canada, the police have begun an old-fashion witch hunt for the people they suspect are responsible for the property damage that occurred during the G-20 in Toronto. "Up to 17 people are being charged with conspiracy and at least 4 individuals still remain in jail. In the wake of the Pittsburgh Summit, many cases still remain in court regarding criminal charges against activists, as well as the excessive use of force by police." HUNDREDS of villagers yelled "death to the United States" and blocked a main road in eastern Afghanistan after U.S. forces killed three innocent villagers. Predictably, NATO forces were in denial, claiming they killed several 'suspected insurgents' and detained a local Taliban commander in the overnight raid. Reports The Associated Press: "In the first six months of this year, 386 civilian were killed by NATO or Afghan government forces — 41 during search and seizure operations such as night raids, according to the United Nations. "The raid in question happened before dawn Thursday in Wardak province's Sayed Abad district — a Taliban-heavy area where Afghan police can only go with very tight security, according to district Police Chief Abdul Karim Abed. "Elders from Zarin Khil village said American troops stormed into a family's house and shot three brothers — all young men — and then took their father into custody, Abed said. Police are investigating the allegations but could not yet confirm or deny the account, he said. "According to the elders, there was no fighting before the troops entered the house, Abed said. "Early Thursday morning, men from the village started to gather in the main market of Sayed Abad to protest the alleged civilian killings, Abed said. The men blocked the main highway going through the area and burned two trucks belonging to Afghan private security contractors, Abed said. "Abed said he did not have more detailed information because he was unable to leave the police compound." RESISTANCE is surging in The Philippines, forcing the state to deploy more troops to try and quell the rebellion. Reports Philstar.com: "The Armed Forces of the Philippines (AFP) said today it was pouring in more forces and equipment to the southern region of Davao where it said the presence of New People's Army (NPA) insurgents is 'more pronounced' or evident. "Brig. Gen. Jose Mabanta, AFP spokesman, said the deployment will be made 'within the next few days' but declined to say how many troops and equipment will be sent to the Davao region where he said the 'enemy activities' is concentrated." The paper quoted Mabanta as saying: "About 30 percent (of the rebel strength) is concentrated in that area. We feel that if we will be able to arrest or defeat the enemy in that area, pretty soon, the other areas (outside Davao region) will fall down like dominos. "We have already sent additional forces coming from Luzon about a month ago. We are still pouring in additional resources, both personnel and equipment...Among the other hot spots, this (Davao region) is where we deem it necessary to focus our effort." 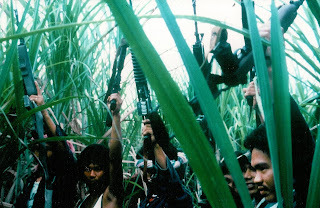 The NPA, armed wing of the Communist Party of the Philippines, has been waging a guerrilla campaign in the countryside for four decades. Military estimates the NPA strength at more than 4,000 guerrilla fighters scattered in more than 60 provinces throughout the country. 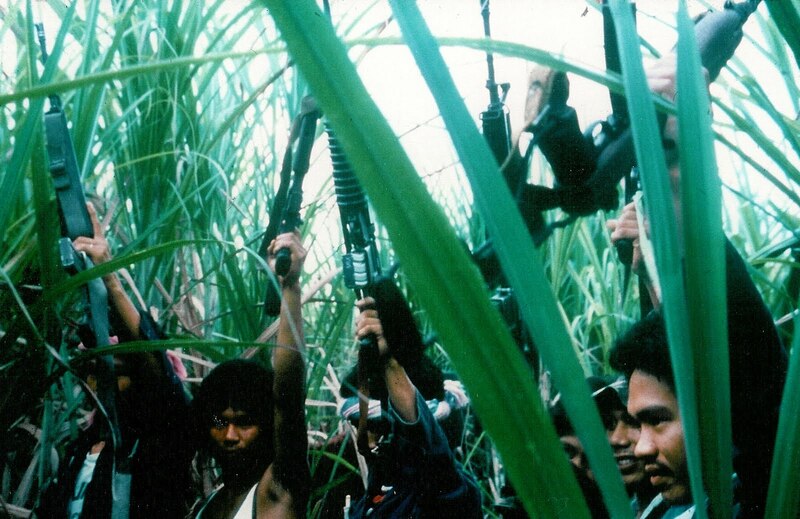 Peace talks between the government and the leftists bogged down after the United States included the NPA and its parent body as foreign terrorist organizations in 2002. Meanwhile, gmanews.tv reports: "Fresh from their United Nations’ peacekeeping stint at the Golan Heights in Israel, at least 170 Philippine Army soldiers are now with the newly-formed 86th Infantry Battalion, which will be deployed in guerrilla-infested villages in the Cordillera Administrative Region. "Cordillera is a hotbed of insurgents. Only last month, seven Army soldiers were killed in ambush in the Mountain Province, forcing the Armed Forces to focus on dismantling the five guerrilla fronts operating in several villages, said Maj. Gen. Rommel Gomez, 5th Infantry Division commander." NAXALITE rebels in India are giving their moral upport to the Kashmiri resistance against the Indian state machine. Reports The Times of India: "In a scathing criticism on the role of the central and state governments, the Naxals have claimed that the enemy was the same, be it at Dandakaranya or Kashmir. "Through a two-page release, the rebels have extended their 'revolutionary salute' or Inquilabi salaam to the Kashmiri protesters fighting for their rights. The Maoists were critical of the use of force by the Omar Abdullah-led coalition government to crush the resistance of the people. "The CC, along with the people's army and other revolutionary outfits, has vowed to continue supporting the valley protesters. "The naxals dramatically equated the stone throwing youths of Kashmir to the bow-and-arrow equipped tribals of Dandakaranya. The CC 'believes that the Kashmir belongs to Kashmiris'. It has also appealed to all to support the 'just national liberation struggle of the people of Kashmir'. "The CC has lashed out at the media for distorting Kashmir's history. Naxals have also urged citizens across the length and breadth of the country to raise their voice against the 'heartless killing of youth' by the security forces. 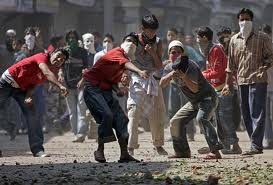 "They have also made an appeal to the activists and right bodies to demand the withdrawal of the forces from Kashmir. The rebels had made a similar demand several times in the Dandakaranya region in the past too." THE AFGHAN resistance will defeat the US-led occupation of their country, Pakistan's former intelligence chief has told CNN. Lt. Gen. Hamid Gul said the United States and its allies won't win the war in Afghanistan and referred to U.S. NATO allies as "pallbearers." Supply lines through Pakistan are shaky, said Gul, who blamed U.S. ally India for contributing to his country's destabilization. Combined with what Gul termed poor U.S. intelligence and a home-field advantage for the Taliban, it all adds up to a losing combination for the United States in his estimate. "Time is on the side of the resistance," he said. The career military officer, who supported the U.S.-backed Taliban resistance against Soviet occupation during the 1980s, called the U.S. occupation of Afghanistan "unjust" and said he sees legitimacy in the Afghan insurgency against Western forces. "This is a national resistance movement. It should be recognized as such," he said. "They are Mujahedeen of Afghanistan as they were during the occupation of Afghanistan by the Soviet Union." The attacks of September 11 were a pretext to a war already under consideration, Gul said. "I think some of the neocons, who were very close to President [George W.] Bush, they wanted that he could embark on a universal adventure of Pax Americana, and they thought that the world was lying prostrate in front of them," he said. The 2001 terrorist attacks helped win the public support for the neocon plans, he said. There was no legitimate reason for the United States to attack Afghanistan, Gul said, because the FBI had no solid evidence that Osama bin Laden was involved in the attacks on New York and Washington. "Why has not a single individual connected to 9/11 been caught in America so far, and why hasn't Osama bin Laden been charged?" With no evidence anyone in Afghanistan was involved, there is no way to legitimize the U.S. occupation, Gul said. Gul's comments were also picked up by the informative War in Iraq website. THE WORLD faces an inflationary time bomb as shortages of food threaten to push prices to fresh all-time highs - with the threat of riots, reports The Independent in London. It says: "A variety of freakish weather conditions across the world has sent the price of staples including wheat, pork, rice, orange juice, coffee, cocoa and tea to fresh highs in recent weeks. "Yesterday's decision by the Russian government to ban the export of wheat to protect home consumers saw grain prices jump 8 per cent on the day, on what was already a two-year high. "Meanwhile, the burgeoning demand for foodstuffs and raw material growth in the resurgent economies of China and India has also driven oil, copper and other industrial commodities higher. "In developing and emerging economies, however, the challenge is in some cases a matter of life and death. "In these countries food represents a much higher proportion of household budgets than in the West, and they are less able to withstand such shocks. Freakish weather, as in Pakistan now, can also lead to immediate demands for extra food supplies. "Fears that the population may simply not have enough to eat because of the drought in Russia, the Ukraine and Kazakhstan, one of the world's great 'bread baskets', prompted the Russian Prime Minister, Vladimir Putin, to sign a decree yesterday prohibiting the export of wheat, barley, rye, corn and flour until the end of the year. 'We must prevent domestic prices from rising, preserve cattle herds and build up reserves,' he said. "Mr Putin added that ending shipments would be 'appropriate' to restrain domestic food prices, which rose 19 per cent last week alone. "Conversely, flood conditions in Canada, another major grower, have also reduced supply. World wheat prices are up 92 per cent since early June. Worse could follow: the Russian weather has also threatened the next sowing season, and has harmed other crops such as sugar beet, potatoes and corn." A BRITISH policeman faces jail after attacking a man in the street in Wigan and then lying about what had happened. 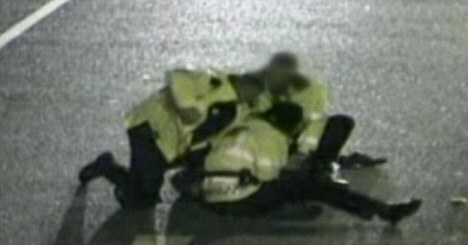 Reports The Daily Mail: "Special Constable Peter Lightfoot, 40, was captured on CCTV striking Mark Aspinall's head on the ground, rubbing his face in the tarmac and hitting him with his police helmet as he was restrained during an arrest. "He claimed that Mr Aspinall, 24, who was then a Lance Corporal with the Royal Mechanical engineers, had been struggling violently as he and two other officers tried to arrest him after he was ejected from a nightclub for being drunk. "During a three week trial at Manchester's Minshull Street Crown Court, the court heard that Mr Aspinall had been charged and convicted of two counts of assaulting a police officer in July 2008, but had later had his conviction quashed at Liverpool Crown Court following an appeal. "In the appeal hearing, Lightfoot told the court under oath that he did not strike Mr Aspinall with a helmet and did not strike his head against the road claiming, 'I did not rub his face in the tarmac there, I was holding his head down'." The case stands in stark contrast to that concerning Ian Tomlinson, where the video evidence of the fatal police assault was deemed insufficient evidence for a prosecution. A UK police station has come under bomb attack. The car bomb exploded near Strand Road police station in Derry, Northern Ireland, reports The Belfast Telegraph. Two men, one armed with a firearm, left a device in a taxi and then ordered the driver to go to Strand Road. The alert began just after 3am on Tuesday morning, August 3. Derry's mayor, Colm Eastwood, said: "There seems to be a fair bit of damage to the police station and some of the buildings across the road." RUSSIAN anarchists stormed a town hall in the latest battle in a longstanding war to protect Khimki forest from a motorway. In dramatic scenes, they pelted it with smoke grenades and fireworks and painted slogans on the walls. 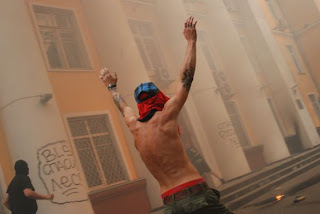 The Moscow Times says the attack "left the building with broken windows and covered in graffiti reading 'Save the Russian Forest', according to Antifa.ru, a web site for anarchists and anti-fascists. "No one was injured because the staff had left for the day, the Khimki administration said in a statement, adding that the building suffered “considerable damage,” particularly to an art gallery it housed. "Security guards present in the building did not resist the assailants, whose number was put at 300 by Antifa.ru." Police described the incident as 'an insolent bandit attack'. A report on Infoshop says local residents supported the protesters' actions. Campaigners point out on an Aljazeera video that the motorway could run next to the existing railway line, but was being deliberately rerouted through the forest in order to open up land for commercial development. BANGLADESHI workers have stepped up their inspiring uprising against slave labour conditions. The authorities and factory owners thought their resistance could be bought off with an 80% wage rise - up to the equivalent of £28 a week. But the rebels are holding out for £46 and gave their answer on the streets. Gulf News reports that Prime Minister Shaikh Hasina on Saturday warned tough action would be taken against "anarchists" as thousands of the workers took to the streets for the second consecutive day. It adds: "The Premier's comments Saturday came as the suburban Savar and Narayanganj districts witnessed clashes between the workers and riot police - leaving dozens of workers and police injured. "The premier’s deputy press secretary Mahbubul Haque Shakil said Shaikh Hasina had said: 'No anarchy and sabotage in this sector will be tolerated'. Shaikh Hasina said the street protests were 'designed to destroy the sector'. "The premier had asked workers to concentrate on their work after accepting the new minimum wage, saying 'their reasonable demands will be addressed after the effects of the world economic depression are over and exports increase'. "Shaikh Hasina had criticised the garment industry for paying low wages to some two million workers at 4,000 factories in major cities and city outskirts. "Manufacturers had staunchly resisted any significant wage increase. "Garments made in Bangladesh are mostly exported to the United States and Europe earning the country more than $12 billion a year - nearly 80 per cent of the country's exports. The following companies are bulk importers from Bangladesh: Wal-Mart, Tesco, H&M, Zara, Carrefour, Gap, Metro, JCPenney, Marks & Spencer, Kohl's, Levi Strauss and Tommy Hilfiger. "Witnesses to the clashes said workers vandalised several roadside business and had put up barricades to disrupt traffic on two major highways for hours. "They said more than 100 garment workers and 20 policemen were injured when violence erupted in the Savar area, 30km north of Dhaka, when the baton-wielding policemen in riot gear tried to remove the highway blockades. "Police said the 'agitators' had also vandalised 50 vehicles including 10 police cars in Savar area. "Highways were also blockaded in Narayanganj, 15km south of Dhaka."